Waiting patiently for confirming signals to appear on multiple time frames. Mostly I don’t have the patience or stamina for the latter, plus non-US time zones make it impractical. However, if you can sit – like a spider with his web – waiting for everything to line up then fast, trend moves can be really satisfying. “Hello Barry — just in case you haven’t received enough kudos for this particular video (although I expect you have) … thanks for a great video. 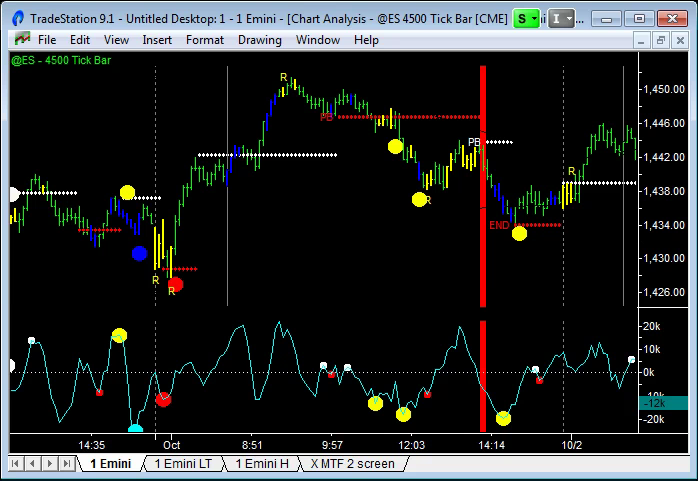 So happy that you stepped outside your own normal mode of trading for this video and showing us how to use the indicators in a slightly different way. It’s a particular gift for us subscribers, and I thank you for it.” Owen S.
The video IS a little long, apologies. The second approach is explained with two different trades shown – a break into downtrend from Friday and a downtrend continuation trade from the previous Monday. In this first trade we had already broken into a down trend and found initial support. From there the Emini rallied – but the rally was weak with Amateur up bars and Amateur activity at the top of the bounce. The trade entry was signalled when all 3 time frames aligned with Resistance lines printing simultaneously. On the 4,500 tick chart the Resistance line was a “Pull Back” (PB) in a down trend signal, as shown in the chart above. The move was good enough to take out 6 points. In this second trade we had already had exhaustion buying and bearish divergence signals on the 1,500 tick chart – my primary time frame for determining trend direction. Rallies were weak with Amateur up bars but we had not yet had a strong down trend break. The trade entry was signalled when all 3 time frames aligned with Support lines printing simultaneously at 1,428. Then when the Support line was broken we moved into a strong down trend move, as shown in the chart above. This move was good enough to take out 5 points. Hope you enjoyed this video on trading using multiple time frames.